Change of Heart is a satisfying book to read! 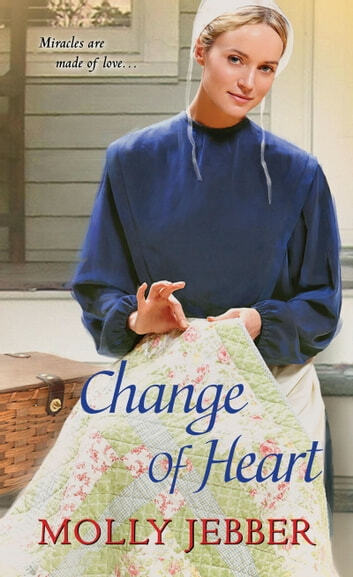 Change of Heart by Molly Jebber is a sweet Christian/Amish romance novel. It is set in 1899. Becca Yost was left at the altar and has decided she needs a change from her community in Berlin, Ohio. Becca is going to visit her sister, Ruth Smith in Massillon. Ruth’s husband died after just three years of marriage. Ruth runs a store called Ruth’s Mending Shop. Ruth left the Amish community to marry her husband, Caleb. After arriving in Massillon, Becca injures her arm. She is lucky enough to meet Matt Carrington, the local doctor. He takes her to his office and fixes her arm. He then escorts her to Ruth’s house. When Matt hears that Becca is a midwife, he asks her to work as his nurse. He has an office assistant, but Dorothy does not like dealing with blood. Matt and Becca get to know each other and fall in love. Matt loves her sweet innocence and Becca decides to leave the Amish faith. However, there is a big obstacle in the way to their happiness—Eloise Carrington, Matt’s mother. She believes her son needs a woman of good breeding and wealth. Matt finds most of the women his mother thrusts at him nasty, bitter, and shallow. Mrs. Carrington tries to buy off Becca without success. She then tries to humiliate her at a dinner, insult her in public, and get others to change her mind. After a while Becca tells Matt that she cannot see him anymore. She does not want to come between Matt and his family. Matt has made it known that he loves Becca and only wants her (he does not care for the opinions of his shrew of a mother). Becca feels that if they are meant to be together, God will find a way. Love is in the air for Becca’s sister, Ruth as well. Someone new to town will capture her heart. The sisters also take in a sweet little boy who desperately needs saving from his abusive and neglectful mother. Change of Heart was a sweet book and very enjoyable to read. I give Change of Heart 4 out of 5 stars. Reading Change of Heart is a pleasant way to spend an afternoon. It has such a satisfying and romantic ending. I received Change of Heart from NetGalley in exchange for an honest review. The review and opinions expressed are my own.